Berta was one of us. She fought for the right to self-determination of her people, the Lenca, and against the destruction and colonization of their land and natural resources. 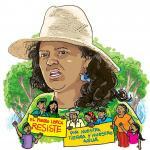 Berta Cáceres stood steadfast and without fear together with the Lenca people and the COPINH to fight the megaproject of the Agua Zarca dam, planned on the Gualcarque River, a sacred place for the indigenous communities and vital for their survival. The Honduran Corporation for Energetic Development DESA - which is building the project - and the Honduran government have responded to the popular struggle with increasing repression and persecution of human rights defenders. Yet, the murder of Berta Cáceres has only intensified the struggle. We are connected to the trial of Berta’s murder because Israel has historically contributed to repression against social and political movements in Honduras. Israel has offered arms and training for repression starting in the 80s, including support for the Contras based in Honduras. Today president Juan Orlando Hérnandez (JOH) prides himself as being a close ally of Israel. In August 2016, JOH signed a military agreement with Israel that aims to strengthen the armed forces, the National Bureau of Investigation and Intelligence and the creation of a cybersecurity project. The weaponry and the techniques of repression that Israel exports to Honduras have been tested and used on Palestinians as part of Israel’s regime of apartheid, colonialism and occupation. The drones that Honduras bought from Israel last year for surveillance purposes have been developed and used especially against the Palestinian population in Gaza to enforce abrutal siege and repeated massacres. As Berta’s daughter, Berta Zuñiga, said, we don’t only want justice for Berta, together with the COPINH and the people of Honduras we believe that the trial must be a step to end impunity of the perpetrators and all those complicit. We are following the trial on Berta’s murder and denounce that, among other irregularities, the Public Ministry for more than two years has persisted in hindering and hiding information violating the rights of victims. Further, the eight ex-employees of DESA and military personnel currently under trial are not the only ones responsible. The entire chain of complicity must be undone. DESA has effectively constituted part of a criminal structure, banks have financed the project knowing its implications and the government of Honduras has given full support to the project and to the repression of the human rights defenders. All those that have planned, ordered and contributed to Berta’s assassination have to be held accountable. Finally, we must work together to stop Israel from exporting its expertise in repression to harm people across the globe. Whether in Honduras, in Palestine or anywhere else in the world: we have to stand in solidarity to end state repression and defeat corporate greed that profits from the violations of our rights. True justice has to be built by the people. Berta Vive! Her spirit inspires our daily struggle.